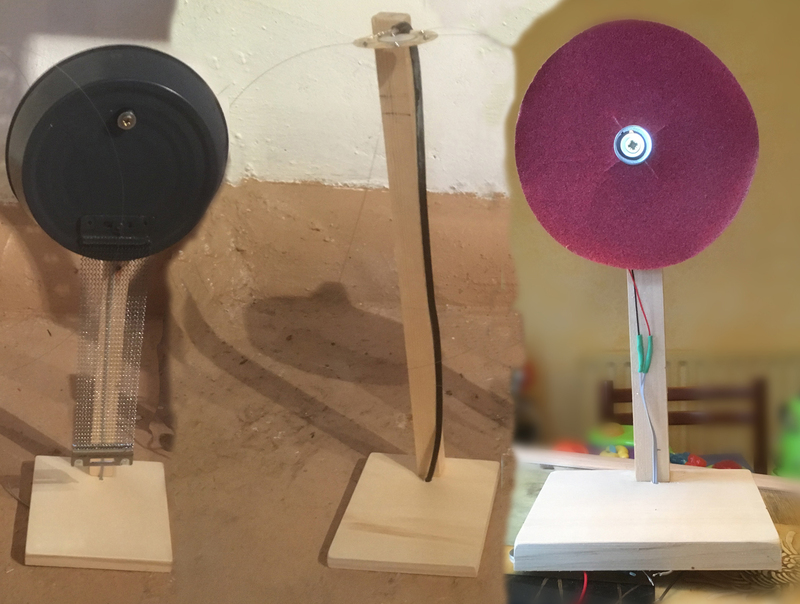 In the previous post in the piezo series I had prepared 4 percussion instruments, all based on making sounds to be picked up by piezo discs. 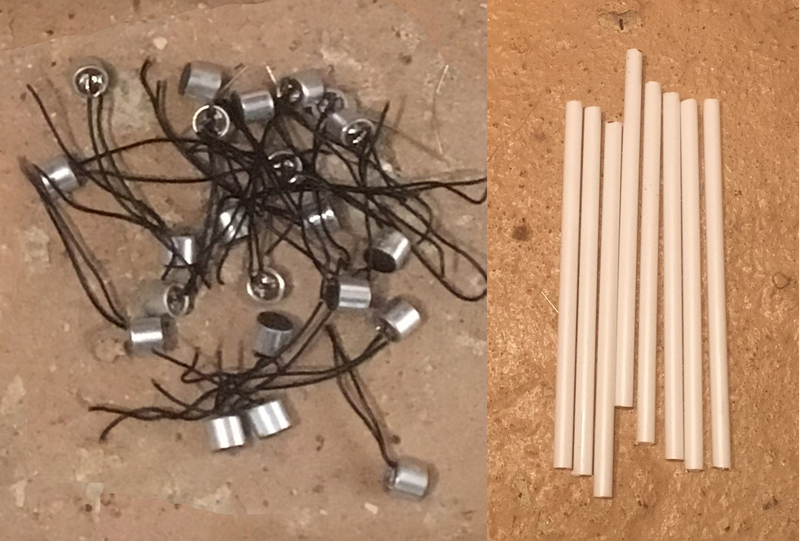 In the picture below, the one on the left has 4 lengths of piano wire soldered to a large (50mm diameter) piezo; the second one has a snare from a snare drum attached to a large, shallow tin; the third one has an adjustable rubber-lined clip designed to hold a Latin American-style rainstick; and the right-hand one is a circle of sandpaper with a piezo disc firmly superglued to the back. In the electret series I had made 2 new instruments in which sounds would be picked up by electret elements, and had identified 2 existing instruments, a xylophone and glockenspiel, which needed amplifying in a similar way. Each of the instruments had its own appropriate preamp, either a piezo type or electret type, as described earlier in the series. 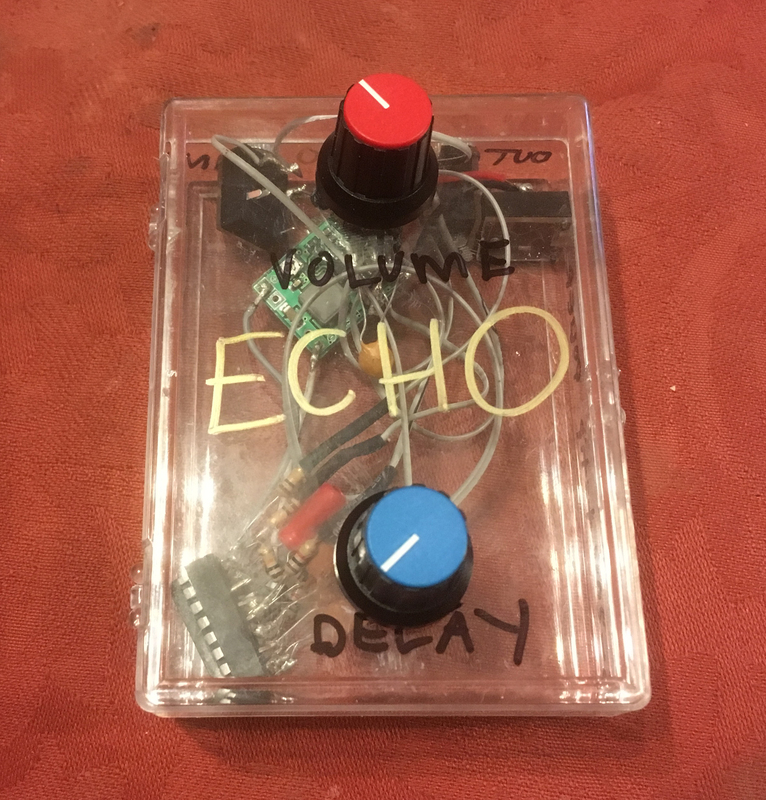 Next, one of the things I felt percussion instruments would benefit from was a reverb/delay circuit, and I had been looking around for a long time for something suitable. 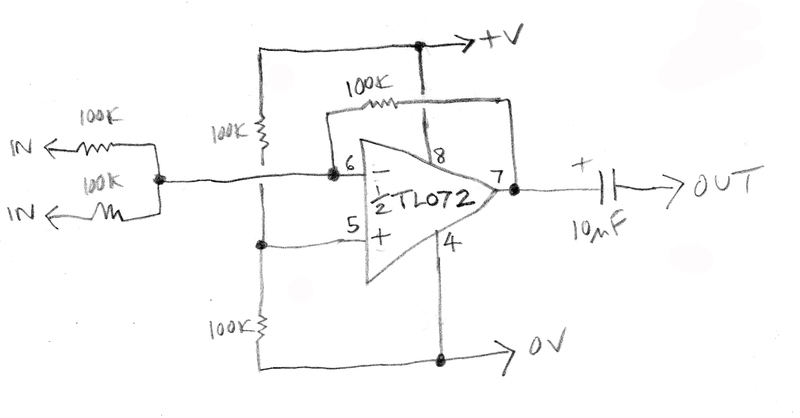 In particular I was looking for a circuit that would be inexpensive, simple to put together, and easily repeatable in different units I might construct or circuit-bend. 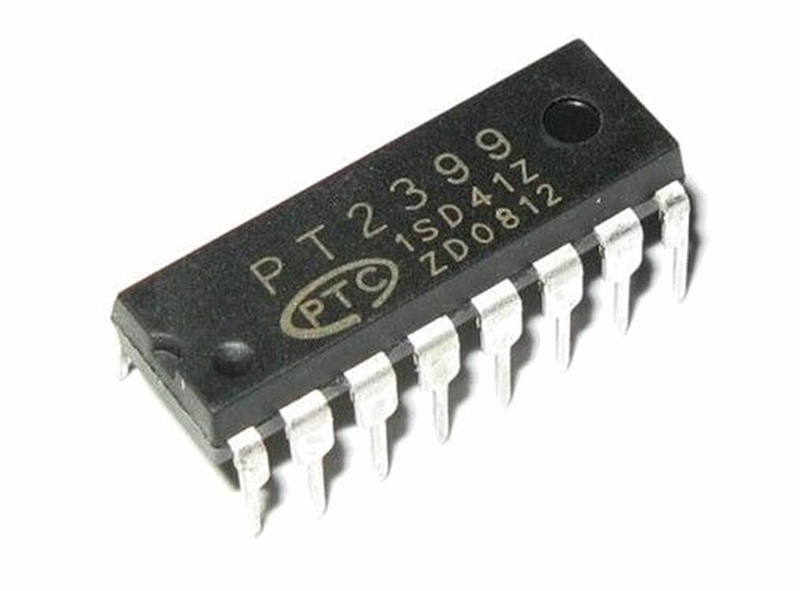 Once I came across the PT2399 chip, I knew I’d found the answer. I managed to get a number of them at about 11p or 12p each, and researched the simplest circuits I could find to make a suitable delay unit. I found one here: http://www.hqew.net/events/news-article/13932.html and put it together. I haven’t labelled it, but the volume pot is 10k. Ideally, this should be a log pot, although lin pots are usually cheaper and easier to come by these days. The component values are all very standardised, as I bought these values in bulk – using either resistors or capacitors in series or parallel, you can get close to other typical values. These values worked fine for me in this context, however. The value of 50k (lin) was chosen for the ‘Delay Time’ control as it gave a very wide range of delay times. In this configuration, the repeat function is fully on, but when the ‘Delay’ control is turned fully anti-clockwise, there are no repeats. One of the slight problems with the PT2399 is its very strict voltage requirements: below about 4.5v it’s unlikely to work; above 6v and it will probably be damaged. I tested it with three 1.5v batteries, which was my original intended power supply for the percussion instruments, and it worked fine. I first wanted to build a stand-alone circuit, however, and for this I used the usual 9v PP3 battery and a voltage regulator to reduce 9v to 5v, which is the PT2399’s preferred supply. The voltage regulators were small DC-DC modules I bought for about 45p each, so didn’t increase the cost of the device too much. 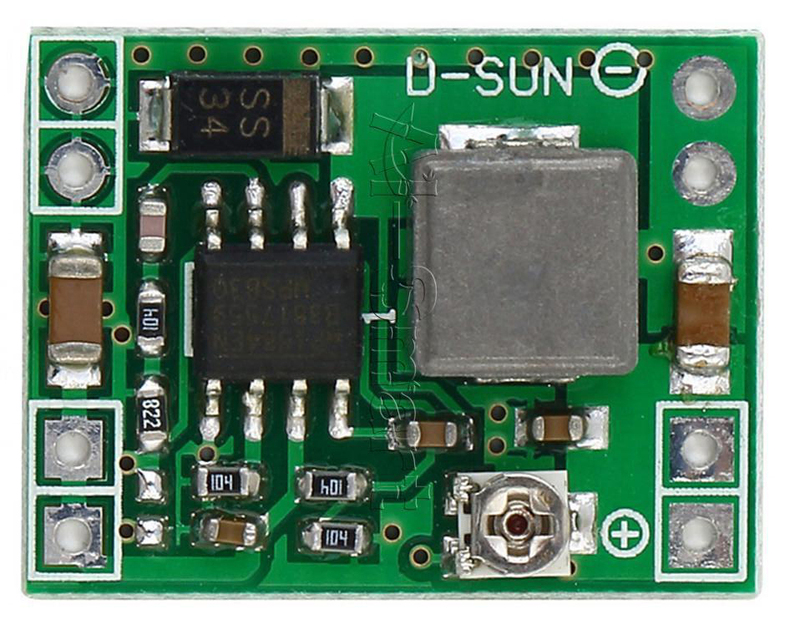 These modules will accept an input voltage of up to 28v, and the output voltage can be adjusted from about 1v to 20v. This view of the finished circuit shows how I put it together: there is no circuit board, but most of the components are soldered to the pins of the i.c. socket holding the PT2399. Made in this way, the circuit would take up very little space in, for example, the restricted space of a circuit-bent keyboard or toy. The 10uF DC-blocking capacitors and the volume control might also not be needed in some applications. It might be somewhat lo-fi, but should be fine in the situations in which I plan to use it. 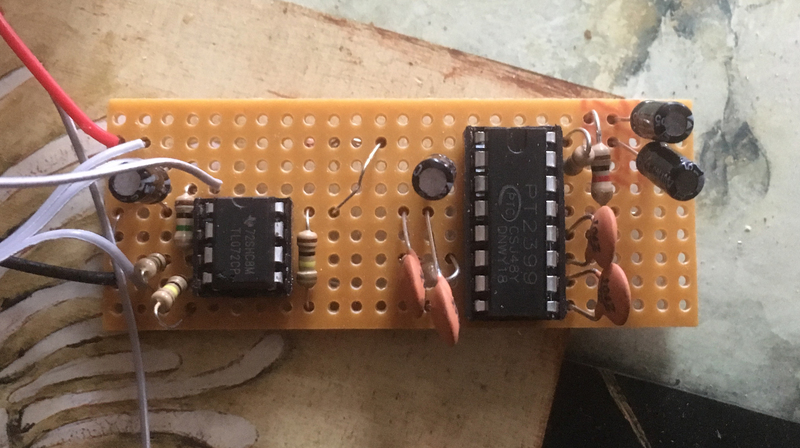 After trying the circuit out in this way, I decided to put one of these units into each of the percussion instruments, and in the case of the piezo-based ones, I made up the preamp circuit boards with the PT2399’s included. 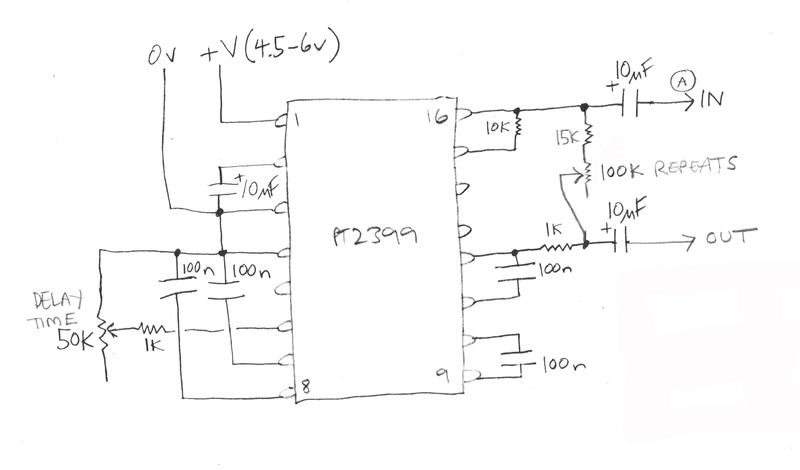 In this case I experienced problems connecting the preamp output directly to the input of the PT2399 circuit; so I added a 2k resistor (actually two 1k resistors in series) between the preamp output and PT2399 input – point ‘A’ in the above diagram. It was at this point when I noticed that the output sound of the PT2399 didn’t include the sound at the input! . . . 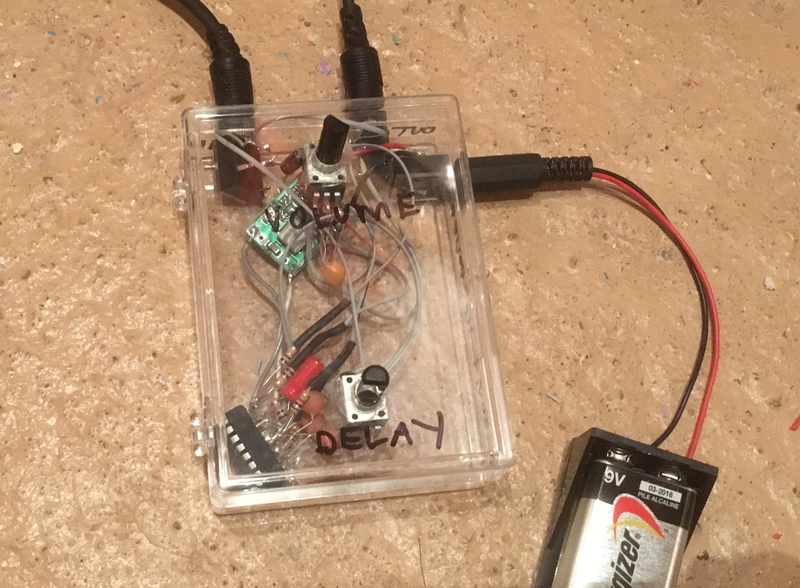 So, in order to hear the original as well as the delayed version, I used the other half of the TL072 as a simple mixer – it’s a dual op amp chip, and only one of them is used for the piezo preamp. Although, in fact, the PT2399 output required 200k-500k, depending on the device, to balance the volume with the ‘dry’ signal. The power connections – 4.5v to pin 8, 0v to pin 4, and 2.25v to pin 5 – were already in place for the half of the TL072 used for the piezo preamp). 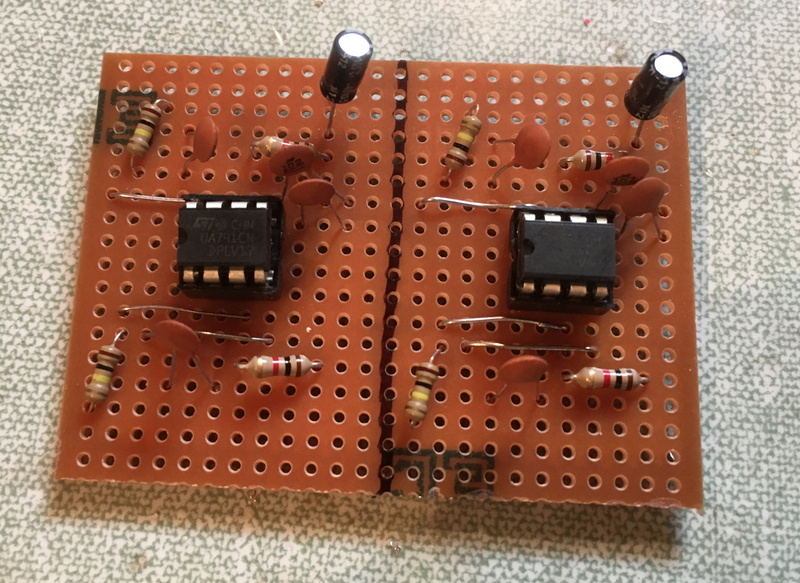 I added one of these boards to each of the four piezo percussion units, plus a volume control between the mixer and the output socket – the odd one out being the one for the rainstick, which was designed to be a stereo device. This meant doubling up each of the elements of the circuit: 2 preamps, 2 PT2399’s and 2 mixers; and using dual potentiometers for delay time, repeats and volume. As the stereo preamp used both halves of the TL072, a second one was needed for the mixer left and right channels. Here’s a sound file of the ‘Snare’ instrument, the Piano String instrument and the Sandpaper instrument. Bear in mind that these are not being struck with any force: on the contrary, they’re being tapped very lightly with a thin disposable wooden coffee stirrer. I wanted to do one more thing with the Sandpaper instrument before moving on. The scratching sound covered a wide frequency range, and I thought it would be interesting to vary the sound by putting it through a low pass filter. 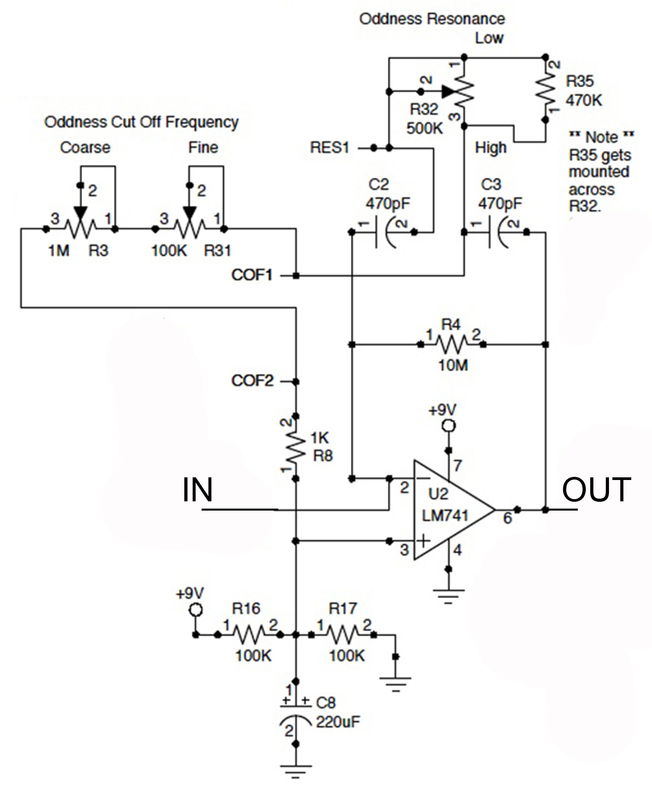 This circuit was placed after the mixer stage described above. I added a 1k resistor at the input, and at the output a 1M preset and a 10uF capacitor. 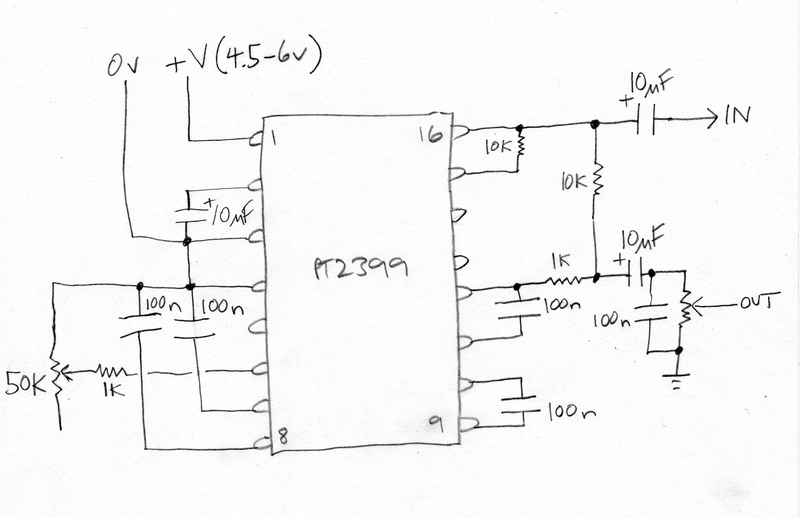 The only change I made to the circuit as shown was to use a 500k potentiometer in place of the 1M potentiometer for the cut-off frequency, and didn’t include a ‘Fine’ control. I then moved on to the instruments with the plastic bottles and the electrets. 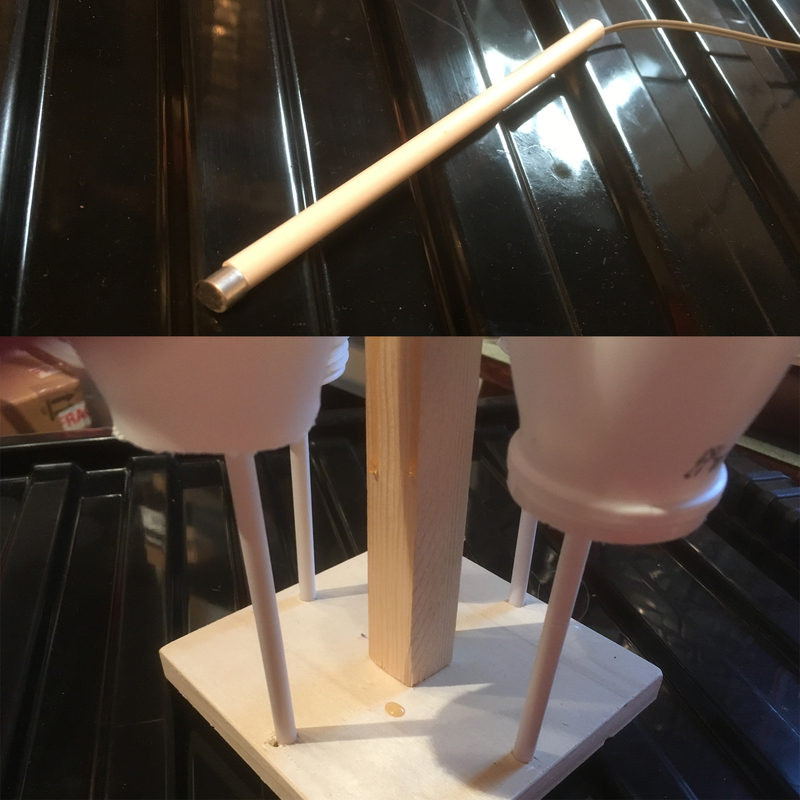 I glued the electrets to the acrylic tubes, and the tubes to the wooden bases, then connected the electrets to the circuit boards I had prepared, each containing both a preamp and a PT2399 Echo circuit. I was basically satisfied with the sounds I’d obtained. 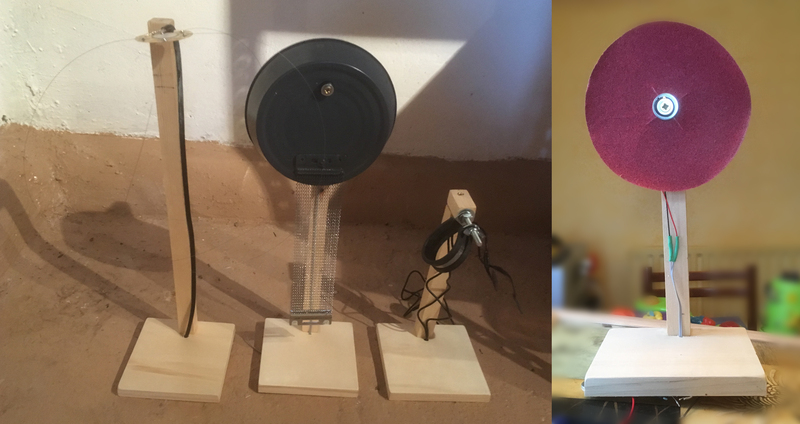 The next article in the series describes how I finished the instruments off. 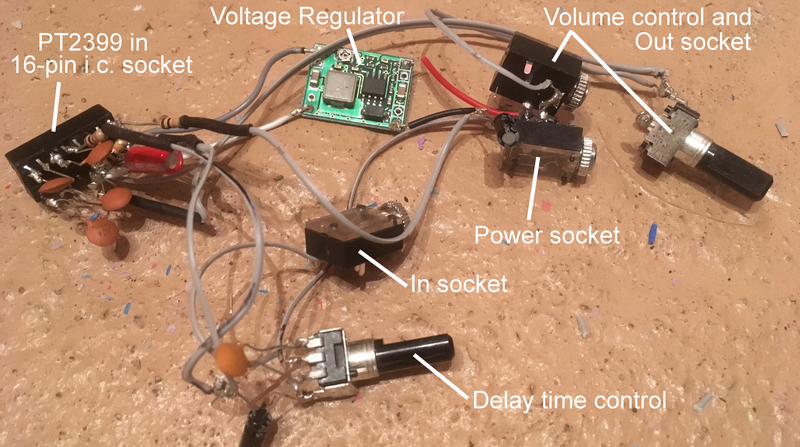 After constructing some preamp circuits for electret microphones, as described in the first article in this series, I started to look at different uses for them. 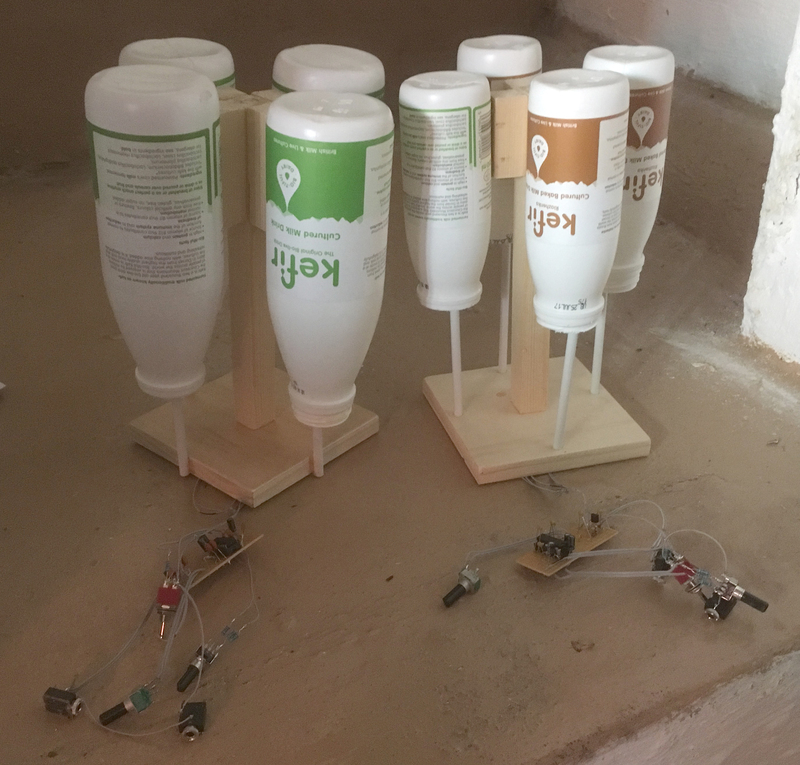 First of all, I had some conventional instruments to amplify – a xylophone and a glockenspiel; secondly, I wanted to make percussion instruments from some plastic bottles. I had a collection of plastic bottles, which would be suitable for tuned (or semi-tuned) percussion. 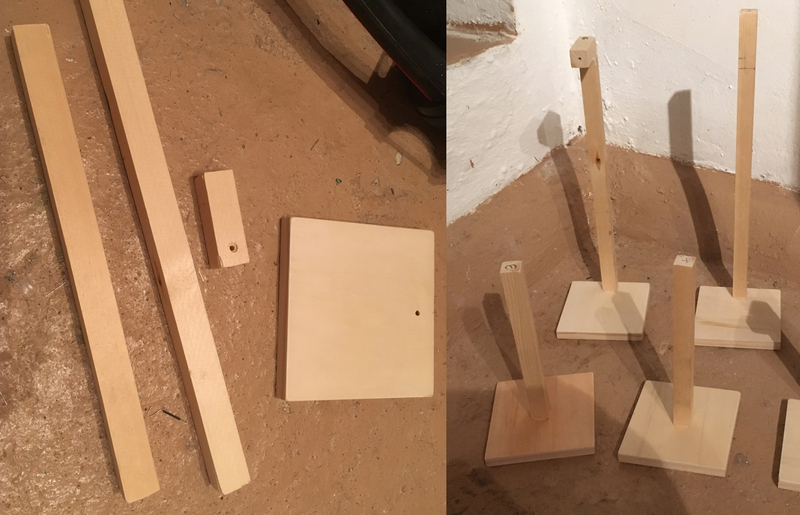 I sawed the ends off, leaving them at different lengths – and therefore sounding at different pitches – and prepared a framework to attach them to. This consisted of small square trays which I bought, and 2x2cm wood, which I cut to length. Each bottle would have an electret microphone inside. The electret elements were salvaged from part of a job lot of voice memo recorders which I bought in bulk on eBay. These were said to be non-working, but their only problem seemed to be that the coin-type batteries had run down. 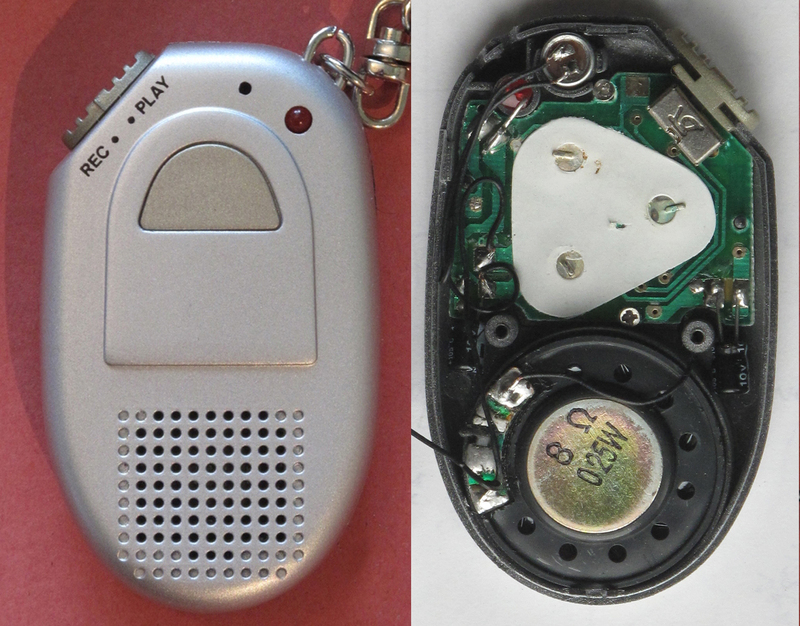 The electret element can be seen in position at the top of the right-hand picture below. The electrets were to be mounted inside the plastic bottles on short lengths of rigid acrylic tubing. 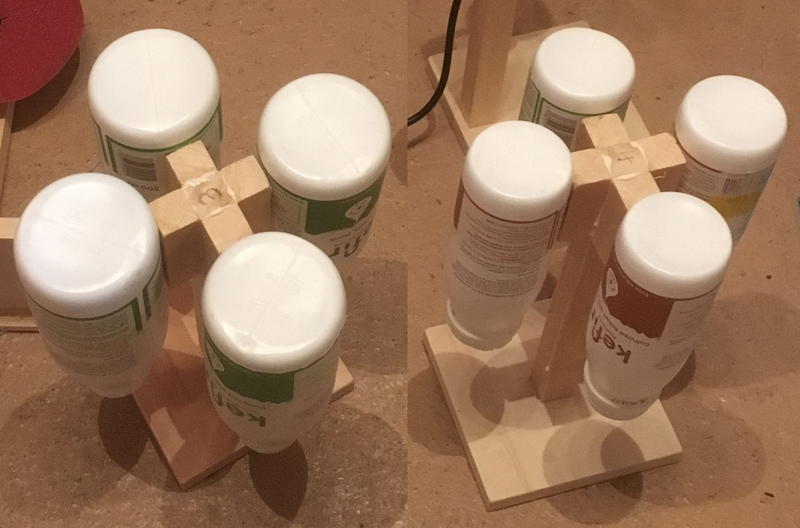 Following on from this post, I will describe the xylophone and glockenspiel which also needed an economical method of amplifying; and then installing the electronics for all the new percussion instruments.